Eye pressure is medically referred to as intraocular pressure and can vary throughout the day, however, this pressure may also cause nerve damage that can result in glaucoma. Normal eye pressure can vary from 10 to 21 mmHg (millimeters of mercury) throughout the day, but if this pressure varies outside of the normal range, it can cause irreversible damage. Continue reading to learn how eye pressure relates to glaucoma, what this pressure is caused by, how it is measured, and how eye pressure is treated. Does low eye pressure cause risk of glaucoma? Eye pressure that dips below the normal minimum of ten mmHg can result in blurred vision as well as part of the eyeball beginning to cave. Some individuals can develop normotensive glaucoma, which is when damage to the optic nerve occurs when eye pressure is below normal. What causes pressure in the eye? Pressure in the eye is caused by the balance between the production and drainage of the clear fluid within the eye called the aqueous humor. This pressure can change throughout the day, and slight fluctuations are considered normal. More significant variances in eye pressure may occur as a result of anatomical issues, inflammation due to trauma or infection, genetic factors, and medication. Alcohol and caffeine consumption can also cause changes to eye pressure, as can coughing, vomiting, or straining while lifting heavy materials, though these changes are often temporary. Ocular hypertension occurs when the eye pressure is consistently above the normal limit of 21mmHg and is considered a risk factor for glaucoma, however, ocular hypertension is not a guarantee that you will develop glaucoma. 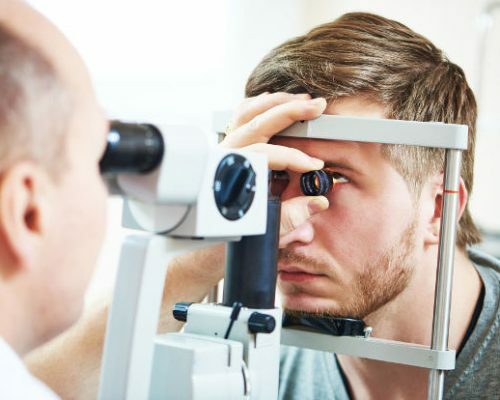 To determine the pressure of your eyes and detect any changes, your optometrist will perform one of two tests known as an applanation tonometry and noncontact tonometry. Applanation tonometry measures the amount of force needed to flatten part of the cornea temporarily using a tonometer. Before the procedure, you will be given anesthetic eye drops to numb the eye, and once this has occurred, your optometrist will place the tonometer on the cornea to determine eye pressure. A noncontact tonometry will measure the pressure in your eye without requiring physical contact. Instead, a puff of air is pushed into the eye in a painless procedure that does not require any anesthetic. Eye pressure changes do not always need to be treated. Your optometrist may prescribe eye drops if you find that the variations in eye pressure are affecting your vision or if these changes are linked to glaucoma. Also, there are a variety of medications that may be used for treating ocular hypertension in order to prevent or reduce your risk of developing glaucoma. In more serious cases, surgery may be required to treat intraocular hypertension or glaucoma to prevent your condition from worsening. If you are concerned about your eye pressure and are hoping to manage it without the use of prescriptions, there are some natural ways to help lower ocular pressure. Be sure to check with your optometrist to determine whether your eye pressure is classified as ocular hypertension and do not use these methods in place of treatments that have already been prescribed to you. Stay hydrated. We all know that drinking lots of water and keeping hydrated is good for your health, and this extends to eye health too. The Mayo Clinic recommends drinking small amounts of water frequently throughout your day in order to help lower eye pressure. Avoid drinking too much at once, as consuming large amounts of fluid in one sitting can actually increase your eye pressure. Manage stress. Stress raises your blood pressure, which can also raise your eye pressure. Much in the same way that managing and reducing stress lowers your blood pressure, it can lower your eye pressure too. Take up yoga or practice breathing exercises and meditation to reduce stress and lower your eye and blood pressure. Minimize your caffeine intake. Caffeine can raise your eye pressure, so limiting your intake of coffee, sodas, and other sources of the stimulant can reduce this pressure. Exercise. Exercises like riding a stationary bike at a controlled pace can lower intraocular pressure significantly as well as improve blood flow to the retina and optic nerve. Eye pressure varies throughout the day and shouldn’t be a cause for concern unless it falls either above or below the normal range of 10 to 21 mmHg. Intraocular pressure that is chronically too high or too low may cause damage to the optic nerve and result in issues with vision that may develop into glaucoma. Ensure your optometrist checks your eye pressure regularly so that any issues can be managed with proper treatment.